People in Manitoba and Saskatchewan are used to dealing with flooding every year. With the flat land, the water goes everywhere. 2009 was a bad year in Manitoba. 2011 was not great. This year the flood forecast for Manitoba is not too bad, but Saskatchewan... Saskatchewan is in trouble. They had a lot snow this winter and now it is melting and communities are experiencing flooding. So far five municipalities and one First Nation have declared states of emergencies. The village of Borden, Saskatchewan is desperately fighting the flooding. Borden and the town of Radisson (also in emergency) are both located on the CN Aberdeen subdivision, part of CN's Prairie North Line. The provincial Water Security Agency is reporting that the water is backed up behind the railway grade today. 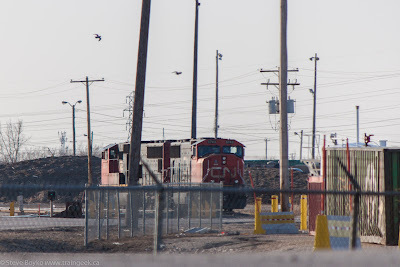 Another town in emergency is Maidstone, on the CN Blackfoot subdivision, also part of the Prairie North Line. So far CN's State of the Railroad says its operations are normal, but they are monitoring the situation. 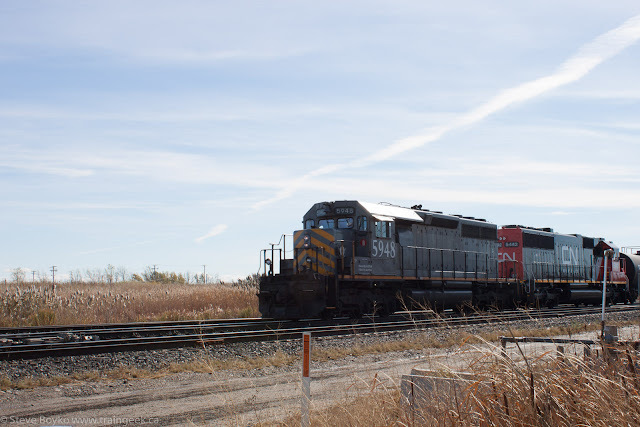 In what might be quite a coincidence, last week CN announced they are investing $30 million in upgrading the Prairie North Line. The investment is to upgrade the line to better serve CN when it has to divert some or all traffic off the main Winnipeg-Saskatoon line. Currently the sidings are in the 6,000-7,000 foot range, not long enough for meets with the typical 10,000+ foot trains that CN runs. CN is also investing $60 million in the main line "for additional double track and new sidings between Winnipeg and Saskatoon on the main line" as well as $15 million within Winnipeg's yards. J.D. Irving, owner of the New Brunswick Southern Railway, is participating in National Rail Safety Week. Good for them! Today is the start of Rail Safety Week, hosted by Operation Lifesaver. 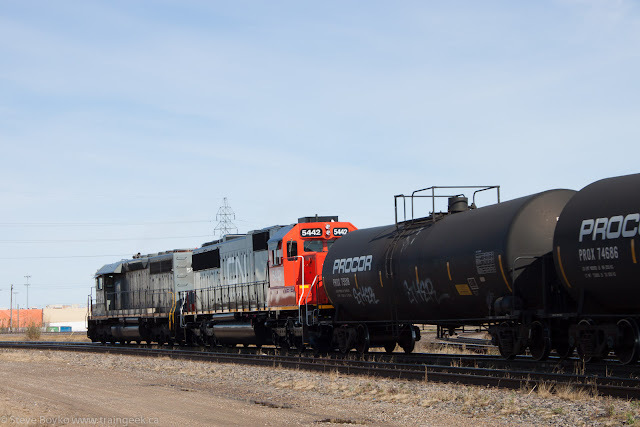 OL is holding events all across Canada to help educate the public on rail safety. For example, here in Manitoba, CN and CP Police will be holding Trespass and Traffic Enforcement activities at various locations throughout Winnipeg and elsewhere all week. On May 1 there will be a mock collision near the Saint John High School in New Brunswick. On May 2 VIA will host an open house at the Halifax station. There are school presentations being held across the country. Operation Lifesaver does great work in helping to educate the public to be safe at railway crossings and to not trespass on railway property. The statistics show that the number of crossing accidents has been on a more or less steady decline over the past 25 years. Still, there is a lot of work to be done. Have a look at all the resources they have... and stay safe around the trains! Here's a few updates on the Maple Leaf Terror Plot, as I'm calling it, for lack of a better phrase. Aljazeera is calling it the Canada train plot. Raed Jaser, of Toronto, is reportedly in "shock and disbelief" at the charges. Tunisian-born Chiheb Esseghaier is being remanded in custody in Quebec, presumably until the legal paperwork is done to bring him to Ontario for trial. He was in court today and doesn't believe the Criminal Code applies to him because it is not a holy book. Good luck with that argument. CNN has more analysis here about the supposed Iranian Al-Qaeda link to the suspects. There are suspicions they are part of a broader network. I thought of these guys yesterday evening when I was shooting a few engines in the Symington yard from the comfort of my car on the side of the road... thinking I might look suspicious doing that. Maybe I did. Because I run a web site and a blog about trains, I get a fair number of emails from people looking for information. In many cases people are looking for historical information, like what train their grandparents may have taken to get from point A to point B, or looking for an old photo of a station. In some cases they are looking for current information on train movements or rail lines. The vast majority are innocent and I have little hesitation providing a response. There have been a couple over the years where I've held back a bit out of caution. You may have noticed that although I publish timetables, I don't publish any recent ones. To me there is little harm in publishing information from 20 years ago but I refrain from publishing more recent timetables for security reasons. The point is that responsible railfans are doing nothing wrong. We are taking photographs of trains from public areas, not helping terrorists. We are out there looking for anything unusual, and hopefully if we spot something "off", we call the appropriate authorities (CN Police, 1-800-465-9239; CP Police, 1-800-716-9132; or your local police department). I've called CN Police before and I would not hesitate to do so again if necessary. An alleged plot to attack a VIA Rail passenger train has been foiled by the RCMP and others, and two individuals arrested. The RCMP issued a press release indicating that Chiheb Esseghaier and Raed Jaser allegedly watched trains and railways in the Toronto area and were in the planning stages for a terrorist attack. Reports say they were under surveillance for more than a year and the investigation involved the FBI, the US Department of Homeland Security, VIA Rail and others. The police also said that they were receiving support from "Al-Qaeda elements" located inside Iran. Officials said there was no imminent threat but that the accused had the "capacity and intent" to commit an attack. This article indicates the route was Toronto-New York, indicating the intended target was the Amtrak Maple Leaf, also known as VIA 97/98 (current timetable). Congratulations to the law enforcement agencies for the arrests (assuming the charges stick). 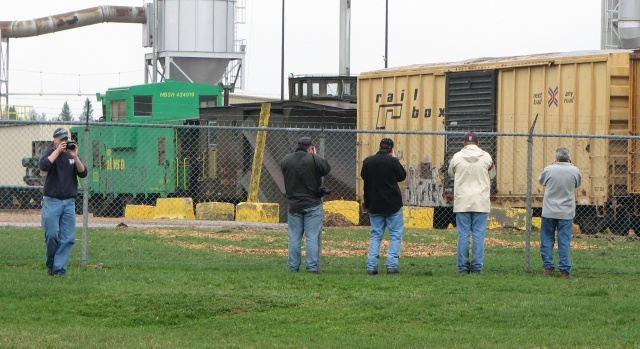 Some have expressed concern that railfans may be "hassled" by law enforcement officials after this. For me, I intend to continue railfanning just as I always have, legally and in full public view with no other reason than for the joy of it. One of the most basic mistakes made in railfan photography is not paying attention to the direction of light. I know this because I made this mistake many, many times. Here's an example of terrible light. I shot NBEC 1855 in Campbellton, NB in May 2009 shortly before it was scrapped. This is straight out of the camera with no editing. Awful, right? Where's the sun? Off to my right, creating terrible shadows on the unit..
Now some creative editing in Adobe Lightroom or other programs can help bring details out, but the result is going to look artificial. Keep in mind that in digital photos, bright areas hold more information than dark areas, so when you lighten a dark area it will be very pixelated. I did some serious smoothing on this image to try to get rid of the pixelation. It's much better if you can walk around and take the shot from a different angle. The common rule of thumb is to have the light source (usually the sun) behind you, over one shoulder. This should give your subject decent illumination, not quite head on but enough to get rid of most shadows. Of course, you cannot always get the angle you want. I was fortunate in this case but in many cases you're stuck with the sun in front of you. What to do? Some people would just not take the photo. I figure, it's digital, why not? Maybe you can get something good out of it. Here you sacrifice all ground and engine detail but you get a lovely sky and some nice light on the side of the train. Notice I'm still on the "sun side" of the train. If I had walked across to the other side before the train came, I would have been shooting right into the rising sun. Shooting into the sun? Well, we can make that work too. The trick is to expose it properly. The sun is going to make your camera sensor underexpose everything. If it is a static scene like this one, you can use HDR like I did and take several frames at different exposures and combine them. Or, you can go for a silhouette shot and expose for the sun and let the subject go totally dark. But what about a moving target, like a train? Well, chances are, unless you are super prepared you are going to be using automatic exposure and you're going to get a dark train. Your best bet is to not do it. Terrible, right? I knew this was a throwaway shot but I took it anyway to make sure my camera was working. I took side shots of each engine as they went by, and the light was better. A "going away" shot would have been even better for light, except that I was on the wrong side of the train! In this case there was no way to get on the other side of the train without being unsafe and trespassing, and I won't do that. Take what you can get. I've only been talking about the direction of light. 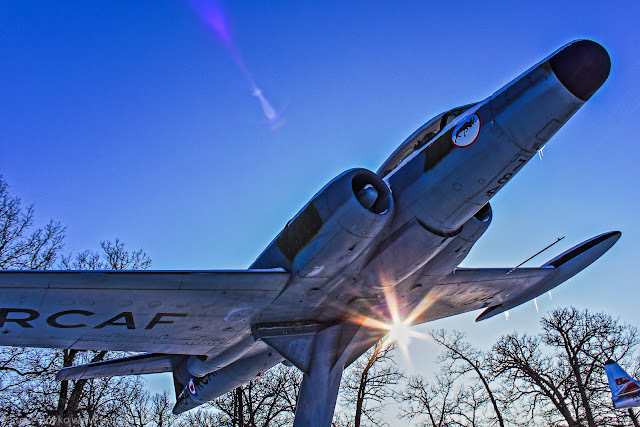 Another whole blog post would be about the quality of light - noon, sunrise, sunset, "blue hour". VIA Rail's Ocean in Rogersville, NB. Photo by David Morris. VIA Rail, Operation Lifesaver and the Dartmouth Model Railway Club have teamed up to present "All Aboard for Safety", an open house at the VIA Rail train station in Halifax, Nova Scotia. This event takes place on Thursday, May 2 from 9 AM to 4 PM at the station at 1161 Hollis Street in Halifax. It will feature presentations by Operation Lifesaver, tours of VIA train equipment, model train displays, and more.